musikCube is much more than an "mp3 player," it is a music library. It currently supports mp3, ogg, flac, and cd audio file formats. It also features an integrated cd ripper helping you take control of your music from the start. musikCube tries to stay as intuitive and attractive as possible without degrading the performance of your computer. We believe very strongly that your mp3 player should not exist only to be eye candy, but be a functional, cohesive part of your operating system. It is the vanilla audio player for Windows. I am posting this THREE years after the Betanoob posted his report on malware in this file. It looks like fileforum.betanews.com hosts or links to installers containing malware and does not take them down when reported by reviewers. File mC2dm3.3.2.exe has the following checksums. Fileforum is thee best place on the net to get your malware and spyware! DO NOT DOWNLOAD or USE this at all. This app is fantastic and probably has one of the best UI in the audio player market these days there are a lot of shortcomings in some expected features and bugs that linger on. The last stable release is almost two years old now. It is really sad that the project entered a stall state in development because if was shaping up to be the best player out there. Nothing fancy here, except the fact that it's the most efficient player I've seen that's actually usable. I've used it on *very* low end PCs running 2000/XP (it works fine under Vista, too) with tens of gigabytes of songs, no problem. The internal database system is fast fast fast for searching songs. It's also music-oriented (hence the name), unlike other players who try to be video players etc. I don't know how it does with streaming, as I don't use it. I also don't know how well it rips CDs, as I use WMP or Audiograbber (another classic) for that purpose. The downside is that development of Musikcube seems slow - although I'm unsure myself what to do with such a good piece of software. One annoying bug I've found is that on a few setups (XP with Windowblinds, Vista), sometimes I can't see the scroll bar and volume control. I'm pretty sure this is a compiler problem, though. Powerful, unpretentious, relatively small memory footprint, fast scanning of large folders of music. Only down side is that it comes with no build in urls to net radio/podcasts in the library, but thats not enough to knock it down to 4/5. Good MP3 player, but doesn't support the mac version of MP3 like jetaudio, qcd, qmp, winamp, and Itunes, do. This is probably the best music program out right now. I've never been a fan of WinAmp, and WMP11 is too much of a resource hog. 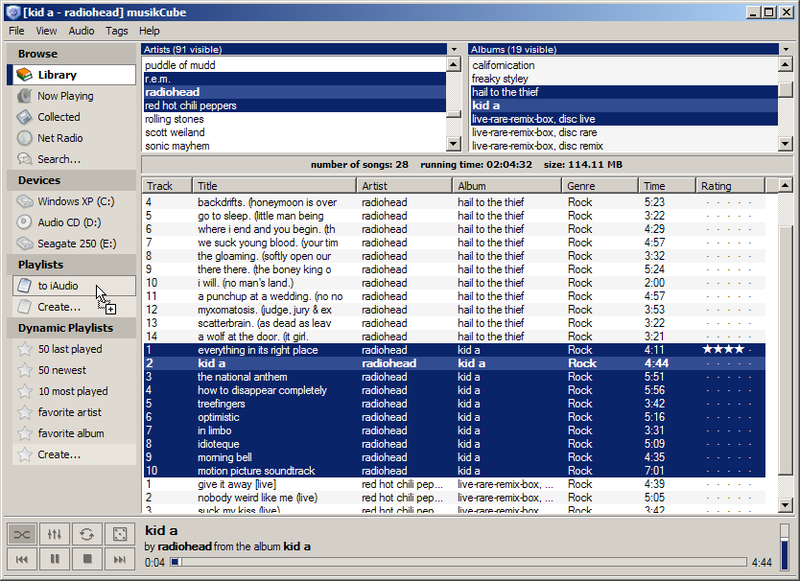 I liked FooBar, but MusikCube does a better job with playlists. Plus it has the addition of Dynamic Playlists, which are actually quite useful for playing the music in your library that you're in the mood for. + The resource usage: unnoticed memory and cpu footprint! I was really impressed, these days is common for all players to use alt least 20MB but this one never crossed 8MB (takes only 2MB when minimized). … I've said to myself that it deserves at least a good review. May I start by saying that this could be a false positive. I have just rediscovered MusikCube and promptly installed it onto my system. During the installation I became concerned when I received a trojan.Win32.Codec1 warning from my anti-virus software (Comodo), not only once but twice. There was also a second warning saying MusikCube was attempting to hook into a low level area, sorry but I couldn't get the details about this. I have conducted a search on the net for this "Trojan" but can't find anything. I have placed a bug report on MusikCube's site so they can have a look at it. With luck it will be quickly resolved as this is an excellent program. The low rate reflects this "problem". its the best free library music player out there. its fast, the interface is clean and simple. it uses minimal ram. 5 points on this one. I will be keeping my eye on future releases, but for now I will still use (pre-Shareware) version of TrayPlayer but since it hasn't been updated in over a year I'm look'n. I like toolbar style players. Winamp has a plug, but winamp in general is becoming bloat (even with modern skins not installed). I nearly converted to this player; however, I like global hotkeys to include the winkey as an allowed keystroke combo which is currently doesn't support. 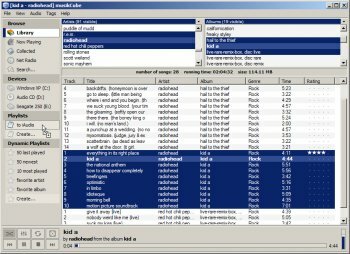 Great alternative to itunes..I can't say that most winamp users will adjust so easily but i do fine..
Best of all I have tested! I have used Winamp and iTunes. For me, a user who needs a highly configurable player with easy access to all songs and playlists, this is better than both. Great interface, great compatibility. For those of us iPod users, there is no Apple Lossless (ALAC) support yet. They're working on it. Nonetheless, it plays all the other files off my iPod and HD better than iTunes or Winamp does. Uses up 4 MB of RAM when it's open and playing, and less RAM when it's minimized. I'm hooked.